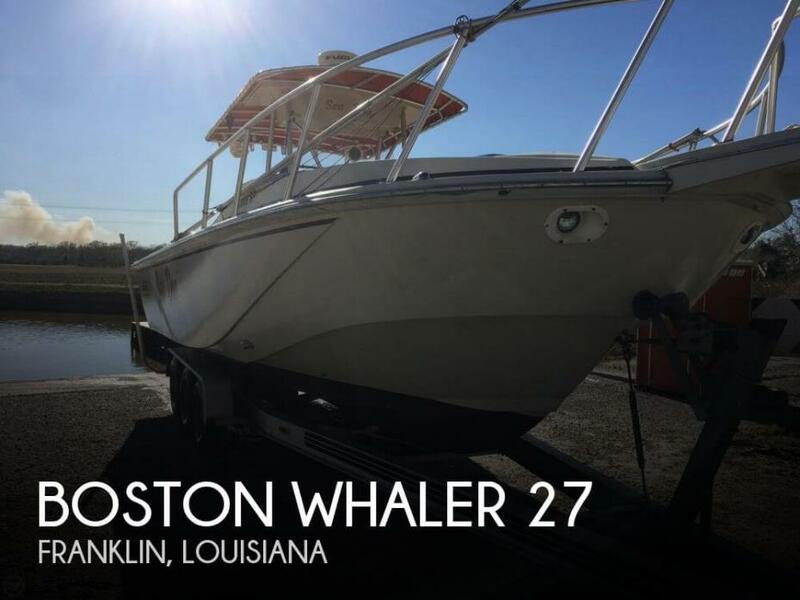 1986 Boston Whaler 17 STRIPER 1986 Boston Whaler 17' Striper with Johnson 90HP, Bimini Top, Boat Cover, Dual Battery, 12 Gallon Fuel Tank, Galvanized Trailer with Spare Tire, Garage Kept. 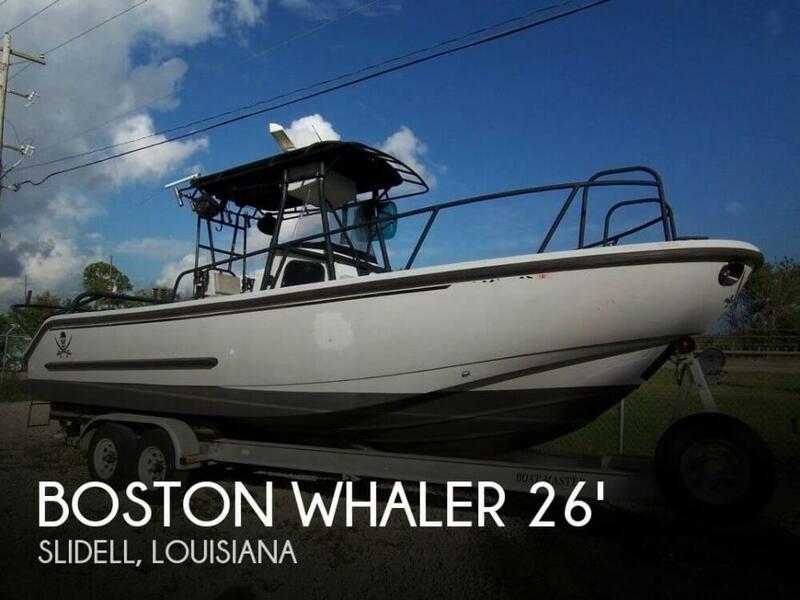 2007 Boston Whaler 130 Sport Powered by a Mercury 40ELPT EFI, Galvanized Trailer, Motorguide Troll Motor, Bimini Top, 2 gas tanks, Tachometer, Very Good Condition. LOCATED IN HARVEY. 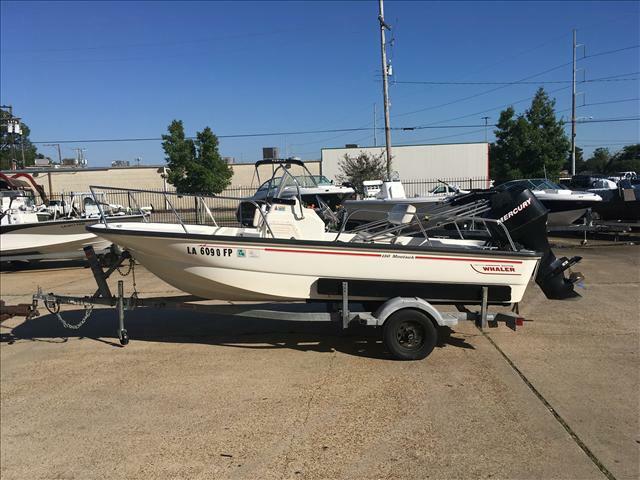 1988 Boston Whaler 18 Center Console Powered with a 2008 Yamaha 150TXR 2 Stroke Outboard in Great Condition and Just Serviced, Digital Tach and Speed, Temp, and Water Pressure Gauges, 2015 Magic Tilt Trailer with Side Guides, New 10' Power Pole Blade, Custom Leaning Post, Custom T Top, Sony Stereo, Uniden VHF, Compass, New Steering Ram, 3 Batteries, Teak on Gunnels and Console Door. 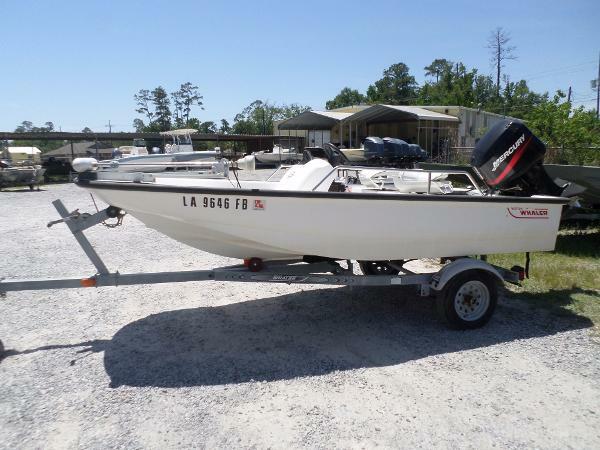 1993 Boston Whaler 19 Outrage II, 1993 Outrage, 150 Yamaha TXRR 2 stroke, Tilt/laydown center console - fits in any garage, only made this model 2 years, Custom Bimini top, Ski package (cushions 3 years old), Trailer 10 years old, axle brakes etc 3 years old (Vault bearings) excellent cond, bilge pump 3 yrs old, New Garmin 54 DV Chirp combo GPS/plotter/fish finder, live well, SW washdown, 80lb Great White Trolling motor never used, New boat cover, always stored covered and under roof entire life, never stored in water longer than 1 week when in use, Waxed every year, shines like a new boat, engine extremely reliable, serviced often, never one single failure etc, compression over 100lbs all 6 cylinders, Hyd Steering 10 yr old by Sea Star (excellent), Old VHF never use, spare prop and other incidentals, Some ski equipment (ropes knee boards),Used very lightly last 15 years maybe 10 hours/year. Bought a large offshore boat and will not be using this boat. Raised 4 children with this boat, very good family bay boat, maintained by someone in marine transportation business entire life. $18500. May post a video later, email me for more photos. 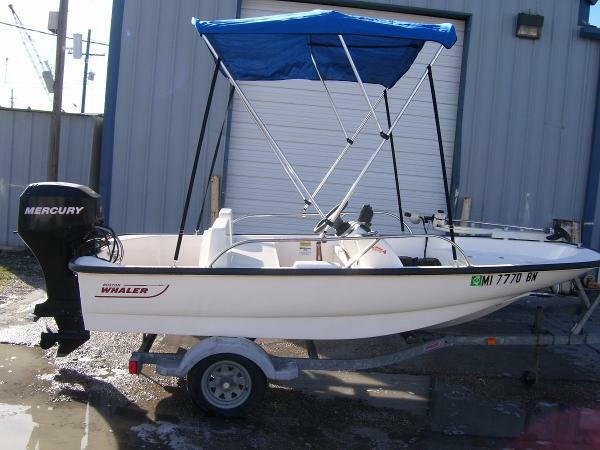 2000 Boston Whaler 13 Sport 2002 Mercury 50 hp with SST prop, and 2000 EZ Loader galvanized trailer with spare tire. 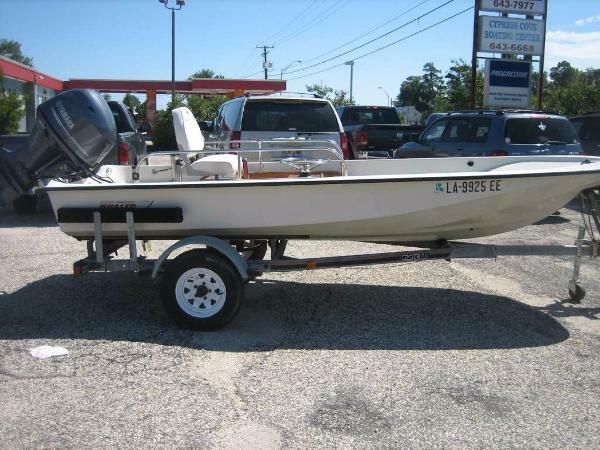 Comes with Motorguide 43 lb thrust trolling motor, 2 pedestal seats, 2 6 gallon fuel tanks, 2 Batteries, rear bench seat, 2 Fishing Seats. 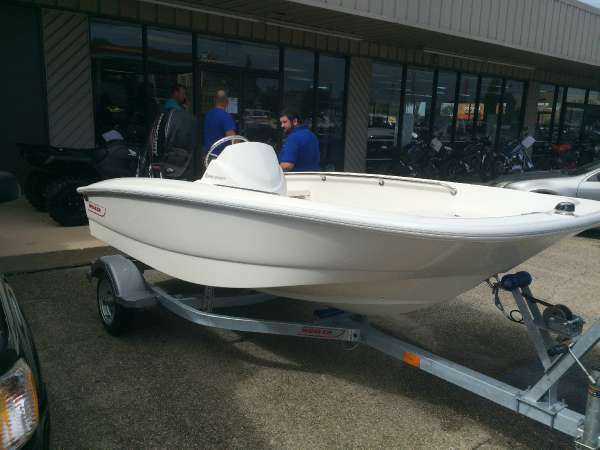 2015 Boston Whaler 130 Super Sport Define your experience with the Boston Whaler 130 Super Sport. Thanks to its modular design concept, you can customize the boat to suit your needs and preferences, and then finish it off with the hull color that reflects your style. 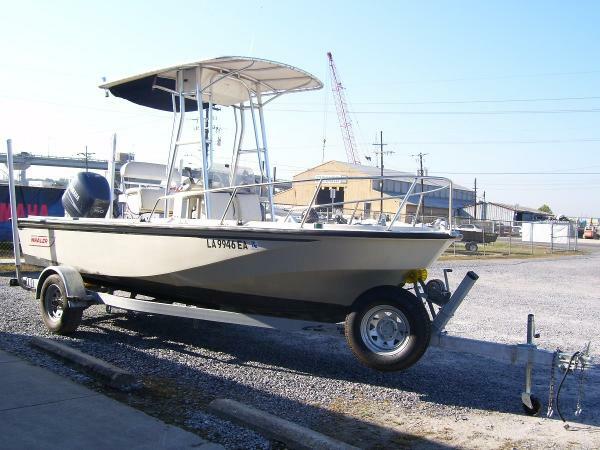 The 130 offers a long list of innovative options and accessories, including a canvas top; fishing boat features such as a carry-on livewell and additional fishing seat; sport boat touches like a stainless steel steering wheel and welded bow rails; and numerous available seating configurations. And at its core, unsinkable Boston Whaler construction means the 130 Super Sport delivers a soft, dry ride. Which means boating that's simply more enjoyable. - Save $7000 off new! 4 hours on the 40 merc four stroke, Galv trailer! Own a un-sinkable legend! Remaining 3 year warranty! 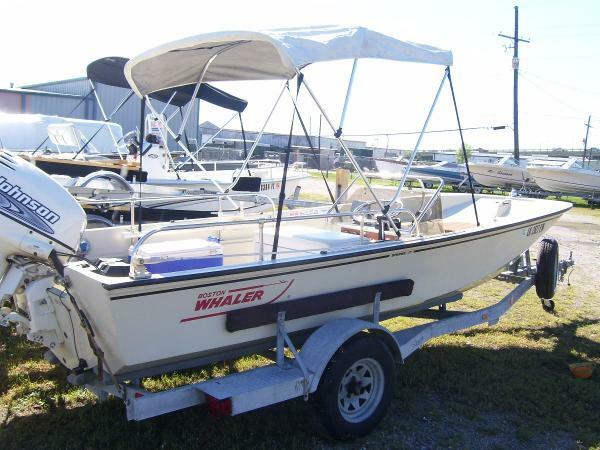 Up for bid is a 1989 Boston Whaler Guardian 22 in good shape. 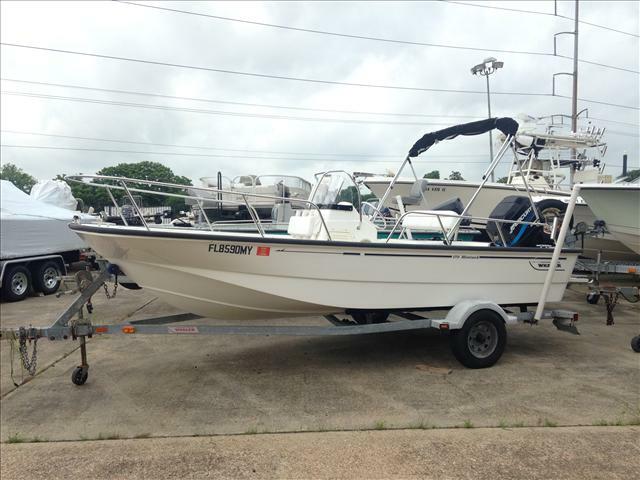 This boat has twin 2003 model Evinrude 115 HP outboards both start and run good. 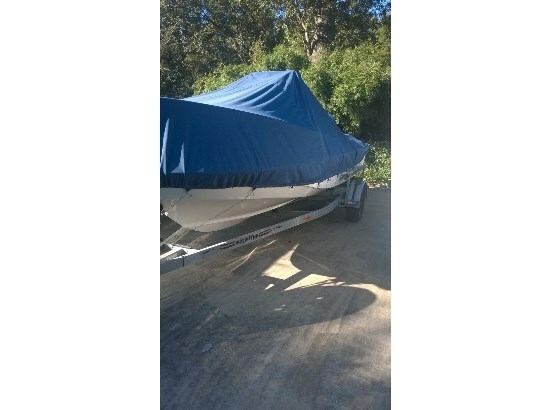 Also included is a heavy duty tandem trailer with new rollers and fenders, comes with a pintle hitch.This boat has VHF radio and a furuno radar. also has a tow bar as shown in pictures. 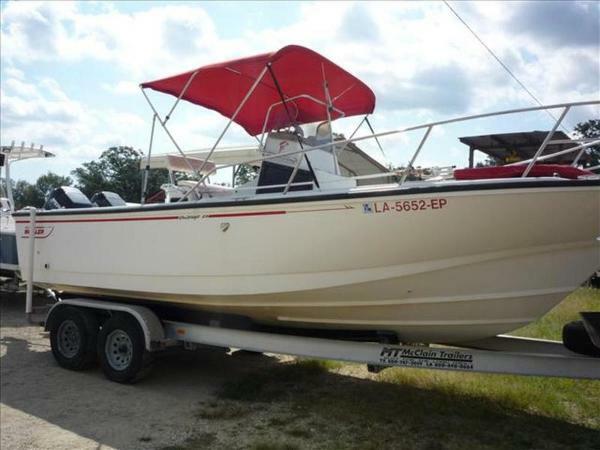 This boat handles very well in rough seas and performs outstanding. $500.00 Paypal deposit due through within 24 hours of the close of sale with the balance to be paid by cash or wire transfer within 3 business days of sale. Buyer is responsible for the pickup of vessel within 7 business days unless other arrangements have been made. Any and all transportation costs & fees associated with moving vessel are buyers resposibility. Boat sold as is where is. Please email any and all questions BEFORE submitting an offer. 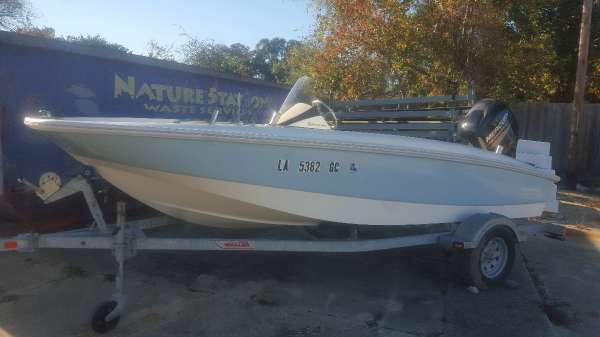 2000 model boat and motor in good solid condition. 2014 Magic Tilt aluminum tandem axel trailer with surge brakes and bearing buddies. Bow and Deck Box Cushions, Onboard Ice Chest, Bimini Top, Large Fish Box, Large Deck Box at Stern with Cushion, Live Well, 90 Gallon Fuel Tank, Fresh Water Washdown, 2013 GARMIN VHF Radio, 2013 GARMIN Fishing Chart and Sounder Combo, 2013 Sony Stereo, new Porta Poti (not installed comes with it, use at your option), Onboard Charger with 2 batteries (one gel), trim tabs and Bimini Top. Minor scratches and normal wear and tare from use, stress cracks around some hardware, some gelcoat discoloration where Items removed or replaced prior to my ownership such as outriggers and stern rails. Boat has been covered and maintained / repaired professionally while in my possession. Runs out great and low fuel consumption with the dependable 2 stroke Direct Fuel Injection Mercury Optimax Saltwater with stainless prop. Tops out at 40+ mph. Comes with Coast Guard Package. 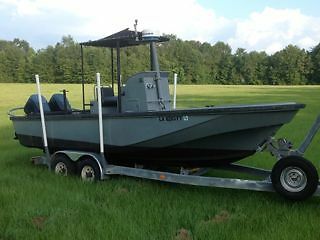 Boat was purchased by me in 2012 from Singleton Marine in Georgia (my son works for them in Dallas). I added new electronics and had it completely rewired to my specs to help insure that corrosion had not gotten into vital electrical areas. To my knowledge, it had two previous owners. Currently having normal maintenance done on engine. New impeller kit and lower unit lube change, new plugs, fuel pump kit, (oil pump changed out last season due to leak), and new fuel rail diaphragm all as a part of my overkill maintenance requirements. I use fuel stabilizer and ethanol treatment with every fill up. Just replaced live well pump motor due to failure. I am proud of the boat that has safely brought me back from every trip. Just getting older and having issues dealing with the sun and heat.